Some of you may have read the blog post outlining my initial foray into DIY printing for conventions. If not, you can find it here for reference. Now that I’ve been printing at home for five years, I figured it was time for an update. Not only have I learned several new tricks but my trusty Artisan 1430 died late last year and I replaced it with a significant upgrade in the Epson P600. 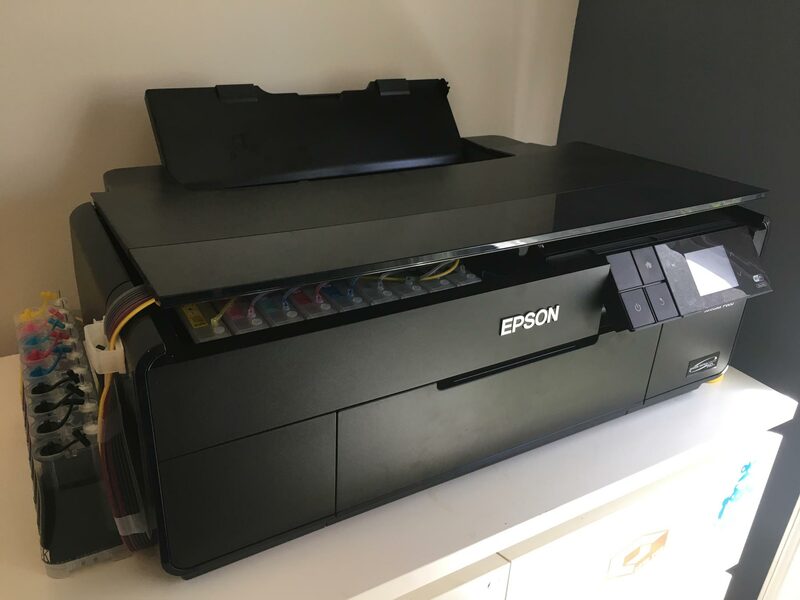 Over the past few months, I’ve run several hundred prints through the new Epson, so I’m now comfortable talking about what it does right (most things), what is mediocre, and what is inferior to the Artisan (price and cost of operation). If you’re wondering where I sourced everything in this article, I will list links to everything I’ve purchased near the end so hang on tight, I’ll tell you where to get the best deals on everything later. 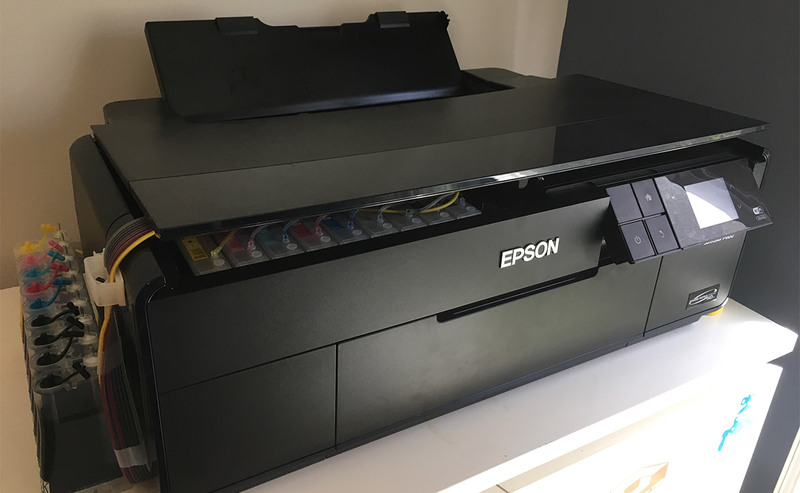 First things first: why the Epson P600? Well, I gnashed my teeth for several months over replacing the Artisan 1430 (still available from Epson, by the way). The Artisan was a fine machine but after the first year, it became finicky. After its third year of operation, it became unreliable. I wasn’t eager to repeat that experience but, to be fair, some of the Artisan’s problems were of my own creation. I’ve since learned how to better care for an inkjet printer so I expect the P600 to be more reliable in the long run (but I hedged my bet by buying a four year warranty on the machine, something I never do for electronics). After reading several reviews – particularly this helpful review from the excellent website The Wirecutter – I settled in on the P600 and started researching CIS (continuous ink systems, a must for this type of work). It turns out that Marrutt USA offered a moderately priced CIS ($110) that didn’t review very well, so I kept looking around… and found nothing. So, whelp, Marrutt USA it was. 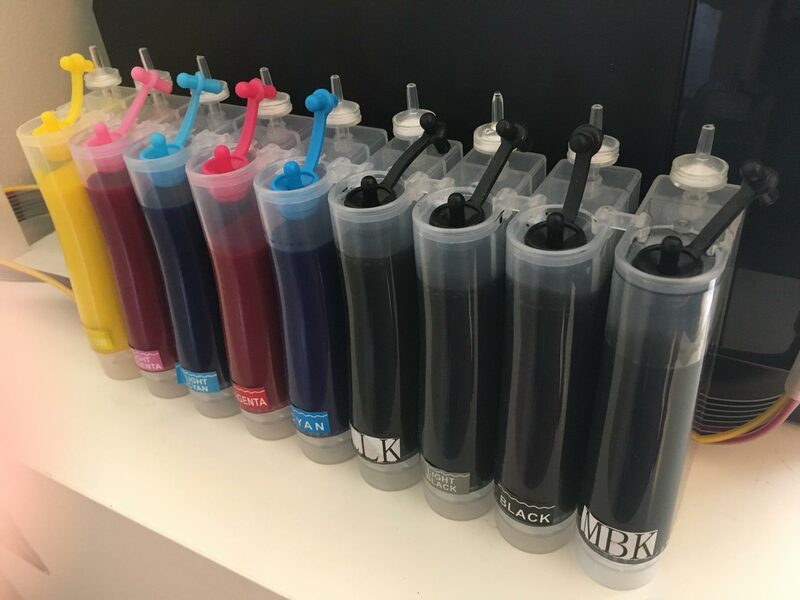 The next challenge was ink: as anyone who knows inkjet printers, ink is incredibly expensive from a cartridge but because I planned to invest in a CIS, there are bulk ink options available. Unlike the Artisan I destroyed, the P600 uses pigment inks, which is printer slang for “really expensive“. Now, don’t get me wrong, pigment inks are superior but they’re also 3-4 times the price of dye inks. Pigment inks are created with just that, pigment. Dye inks are basically artificial creations. The upside here is that pigment inks last for years with no discoloration. Dye inks are spotty in this regard: a few claim archival status (and don’t entirely believe it, as the claims are often bogus) and most begin to fade within a few years of printing, even if they are properly preserved under glass and away from direct sunlight. A secondary thing to note about pigment inks is that, because they’re sourced from natural materials, they tend to desaturate compared to dye inks. 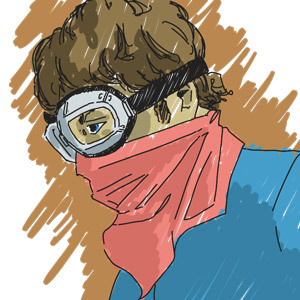 This isn’t a problem with my own work – I tend to prefer a bit of desaturation – but you may feel differently. Either way, it needs to be mentioned. Even 150ml bottles of pigment ink are expensive (over $110 for a set of nine colors for the P600) so I needed to go bigger. In the end, I found the Colorstore on Amazon, which sells giant 1 litre bottles of pigment ink specifically for this printer. The third challenge, one I already had experience with from years of printing, was paper. I am upping my convention game this year, attending at least a dozen conventions. The old 50- and 100-packs of paper meant I was leaving money on the table so I needed to, once again, go bigger. For years, I used Inkpress luster paper, which does the job well but lately, I had received more shipments of paper with bent edges (a disaster for inkjet printing; it causes smear marks and ruins your print heads if you let it go for too long). If you’re careful bending the edges back, it’s not a problem but something to keep an eye on with any paper shipment. Inkpress had served me moderately well over the years but the fact that they sent bent paper so often and didn’t offer packages larger than 100 sheets, it was time to look elsewhere. So, once again, unto the breach of photography forums (a great resource for inkjet printing needs). I stumbled across people talking about InkJet Art paper, which clocked in over a dime cheaper per sheet than the equivalent Inkpress paper because they offer giant 500-sheet boxes of the stuff. As it turns out, I prefer the InkJet Art paper over Inkpress; it’s a brighter white and has a slightly rougher coat, which I find appealing. I should probably mention “why luster?” I talked about it quite a bit in my post from five years ago but gloss is too, well, glossy for artwork. It creates that “Wal-Mart photo center” sheen that makes art unappealing and cheap-looking. Semi-gloss is better but still has too much sheen. I settled on luster paper because it has a touch of sheen but is a bit closer to matte paper, which presents art very well. Matte paper is also an option but, in general, I’ve found it’s too expensive and certain kinds of matte art paper require single-load feeding into the printer. If you want to spend the rest of your life watching a printer operate, that’s not an issue. For me, I’d lose my mind feeding sheets in one at a time when my goal is bulk printing of 10-30 sheets at a time. Many paper suppliers offer sample packs for testing their various kinds of paper. If you go the DIY printing route, I highly suggest you try your own paper options and come to your own conclusion. So there you have it. I was now prepared with a printer, a CIS, bulk ink, and paper. The grand total for this new setup? $1700. Ouch. And if that’s still too much, you can always buy an Artisan 1430 and try this process for well under $500 (obviously, you don’t need to buy gallons of ink and reams of paper to start this process). Everything I wrote in that article five years ago remains true. The Artisan 1430 is a great gateway printer for this kind of work. So, on to some print comparisons. I’m not going to show full images in this comparison because I’m using a colleague’s print for reference and I don’t want to show their work in a negative light. My Epson P600 print is on the left, their generic print (the kind you’d get from any online or local shop) on the right. We’ll start back a bit so you can see how the images might look at a glance to the naked eye. This is 100% magnification on the images, which were scanned at 600dpi. No color correction or alteration was done on any of the images so keep that in mind. Like most scanners, my home scanner desaturates everything a bit so under normal conditions, I’d saturate these images in Photoshop before sending them to print. My Epson print shows clear lines and no rosette (a flower pattern in slightly misaligned prints). The generic print shows slight distortion but not enough to detract from the image at a glance. So now let’s jump to 200% magnification. Okay, there we go. Now you begin to see that flower pattern become prominent on the generic print while the Epson remains true. Any distortion in the Epson image you see is likely from working at a lower DPI during digital art creation than any flaw in the printer itself. Now we move all the way to 400%. Yikes. I don’t think I need to explain what’s happening here. The Epson is showing paper grain but the quality is still rock-solid. The generic print, not so much. You may say “But who looks at prints that closely?” Well, few people look that closely but don’t believe that the differences are invisible at a glance, either. The Epson, even at a glance, has laser-sharp prints when placed next to a generic print. If you take even a cursory look at the print, the difference becomes more stark the closer you examine the two side-by-side. The best part? Once you choke down the initial price of the goods, the cost-per-print is low. Including paper and ink, I pay roughly $.45 per 8.5×11″ sheet and roughly $1.50 per 13×19″ sheet. Try to beat that at a local printer without having to swallow the idea of printing 250 sheets of a single print and possibly sitting on that inventory for 3-4 convention seasons. And then multiply that by selling 50 different prints. You’ll have a garage full of prints, all susceptible to aging and loss of some kind. Never mind that you have to post all that money before you sell a single print (which negates a lot of the initial expense of my DIY method) or that you need to drive to and from a store to get the prints. – Don’t let your inkjet sit for weeks at a time. Every time you need to use it, you’ll have to spend time cleaning the heads and wasting ink. As a printer ages, this process becomes longer and longer until I was spending close to an hour with my old Artisan when it sat for a time. I never let the P600 go for longer than two weeks without running a handful of prints through the printer. This is quite convenient, as it means I rarely have the “convention rush” where I have to put 100 sheets through the printer in a day. – This is for PRINTS ONLY. I have not used this process for printing my own book. I suspect that it’s possible but it’s not something I have done myself so I cannot recommend using the printer in this way. – After a few thousand prints, your printer will fire off an error, saying its ink pad is full and it needs an official Epson technician. For about $10, you can buy a reset code from any number of internet vendors and continue on your way (just do a search for your error code if/when this problem occurs). – Installing a CIS is a long process… roughly two hours for the P600. Stick with the instructions word-by-word, follow through the steps, and don’t assume you know what you’re doing and jump ahead. Take the time, do it right. I believe this complex installation process is what resulted in the Marrutt CIS receiving bad reviews, as I have zero complaints with the system. It hasn’t caused any problems at all. Now, on to the link section! That’s all I have for today! Please feel free to post any comments or questions you have on this printing solution!